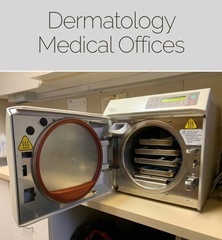 M30027 Complete liquidation of this dermatology medical offices, equipment, furnishing, fixtures and instrumentation.ONLINE NOW! AUCTION CLOSING DATE: Wednesday, April 24th, beginning at 11:07 am. Bidding closes on the first item at 11:07 am, then closes at the rate discussed in these Terms and Conditions of Sale. ALL REMOVALS WILL BE BY APPOINTMENT ONLY. A SIGN-UP GENIUS LINK WILL BE FORWARDED AT THE CLOSE OF THE AUCTION.